“Home is where the heart is.” For most, the purchase of a home represents their greatest investment of time and money. Yet given the economy, many wonder about the value of going Green. Thankfully today’s real estate market allows wise buyers to enjoy the benefits of beauty and energy efficiency! Why settle for an ugly energy waisting tragedy when you could be enjoying the savings and comfort, health benefits and peace of mind our Energy, WOW and Done packages provide? GreenEarthEquities.com is happy to help current and future homeowners sort through the hype and discover how to get the most energy for their buck without sacrificing elegant living. 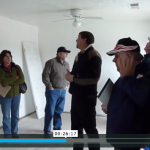 Tenant Energy Interview 3405 N. Miami Fresno, CA Join Dave Robinson in a lengthy interview with Frank Sweeney Jr. and his wife as they discuss their thoughts on their new home, it;s comfort and energy savings. [vimeo width="650" height="425"]http://vimeo.com/32463543[/vimeo]Continue Reading! Watch as Dave Robinson leads you through the ins and outs of installing and using his favorite home energy monitor, the TED 1000. Recently moving from Fresno California to Round Hill Virginia he's interested in monitoring the energy impact between climates and construction standards. [youtube]http://www.youtube.com/watch?v=jOGiuhsSWZA[/youtube]Continue Reading! Watch GreenEarthEquities abridged introduction and interviews with Dave Robinson and our Energy Renovation Team. A one hour extended version of these interviews is available to G.E.A.R. members. For more information click here. [youtube]http://www.youtube.com/watch?v=NU0YwDyyZc4[/youtube]Continue Reading! Part 3 of a 4 part series on GreenEarthEquities’ solar installation on our rental property located at 3405 N. Miami Fresno, CA 93727. With an already amazingly tight shell seal and insulation package, as well as our trademark Mini-Split HVAC, this 3 Watt Solar System brought the energy usage to near zero! [youtube]http://www.youtube.com/watch?v=G4JfzQh2OX0[/youtube]Continue Reading! Part 2 of a 4 part series on GreenEarthEquities’ solar installation on our rental property located at 3405 N. Miami Fresno, CA 93727. With an already amazingly tight shell seal and insulation package, as well as our trademark Mini-Split HVAC, this 3 Watt Solar System brought the energy usage to near zero! [youtube]http://www.youtube.com/watch?v=34zOls1cC18[/youtube]Continue Reading!